As people age, their need for medications can rise. Managing medicine for the elderly can become a tricky process, especially if they see multiple doctors or use more than one pharmacy. 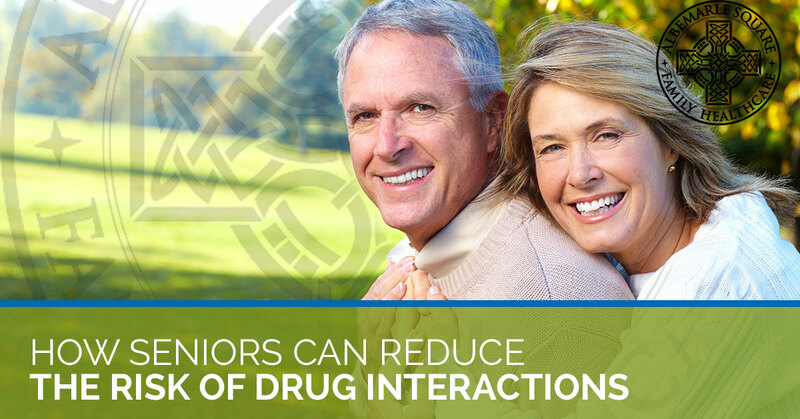 Seniors are particularly at risk for drug interactions because of these factors, and some of these interactions can be life-threatening. In this article, we’ll go over some of the ways you can reduce the risk of drug interactions. Albemarle Square Family Healthcare is Charlottesville’s family and geriatric medicine practice. When you’re in need of geriatric health maintenance, our team of doctors and nurse practitioners can help you! Give us a call today to learn more and to make an appointment. Here are some ways to safely manage medicine for the elderly. Electronic charting has made medication management more efficient than ever, but when you’re seeing multiple providers who may not all have access to the same system, communication can become difficult. Make a list of all the medications you’re taking, the doses, the times of day you take them, who prescribed them, and what you’re taking them for. And don’t forget to add any vitamins, minerals, herbs, and supplements—those can also cause interactions with medications! Carry this list on you, and be sure to keep it updated. While the use of electronic charting has helped physicians and pharmacies communicate, when people use more than one pharmacy, the pharmacist might not be able to see the big picture. They may only have access to prescriptions filled at their location, so if the patient is getting prescriptions from two or more locations, the risk of drug interactions rises. When you use only one pharmacy, your pharmacist will be able to access all your information and alert you to possible interactions. If you must use a second pharmacy, let the pharmacist know of all the medications, supplements, herbs, and vitamins you’re currently taking. Whenever you visit a healthcare provider, be sure to update them on any changes in your medications. This is where your list will come in handy! Discuss not only the medications, but why you’re taking them, with your medical providers. It might seem straightforward, but you should always discuss how to take your medications with the prescribing provider. Ask if they should be taken with or without food, if any foods could change the way they work (grapefruit juice can interfere with heart medications, for example), and if any other supplements could interfere with them. Your pharmacist is also an expert in the medications and their interactions, and is a wonderful resource for any questions you have. While many think of supplements, herbs, and vitamins as being “natural,” in truth, they can cause harmful effects when not used correctly. They aren’t monitored or approved by the FDA, and aren’t held to the same standards of clinical testing as prescription medications. Some can cause the blood to thin, interact, or interfere with medications. Discuss all supplements with your family and geriatric medicine providers and pharmacist. If you or somebody you love is taking medications, knowing how to manage them safely is of the highest importance. When you need a doctor or nurse practitioner to help with geriatric health maintenance, Albemarle Square Family Healthcare is the place to turn. Our team can provide top-notch healthcare for senior citizens, and help manage medicine for the elderly. Contact us today to learn more and to schedule an appointment!